CuCo are proud to announce our recent re-brand of the Offshore Cafe down at the Bournemouth Seafront. As a design studio, we always draw up the initial creatives and work from there. The Offshore Cafe was no different. 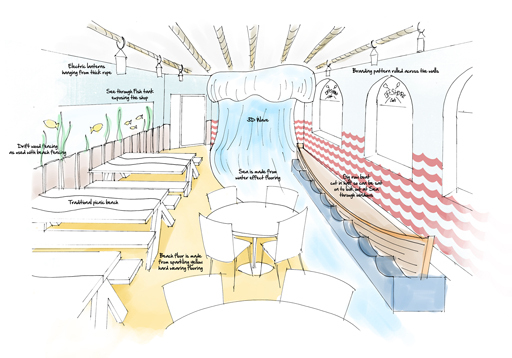 Given that the Offshore Cafe is overlooking our stunning award-winning beaches, we knew we wanted to utilise as many sea elements as possible. We also wanted to explore the possibility of incorporating rowing elements to the design, as for years the Bournemouth Rowing Club has been situated right next door to Offshore. From this initial concept, we decided to make the waves an integral part of the logo and branding. We also felt a frost effect on the windows with reverse lettering would give a New-England elegant feel, which would enhance the comfortable atmosphere people look for when visiting a sea side cafe. This theme was carried through the menus and menu boards to give a cohesive identity and branding to the Cafe as a whole. For the menu boards we used a rope you would normally see on fishing boats to tie in with the waves. We then used oars to act as informational sign. In addition to this we created a whitewood washed effect to all the frames throughout the Cafe as well as in to the Bournemouth Oceanarium shop next door. As an agency we were ecstatic to see the end result come together so well. We truly feel that the waves, the ropes, the frames and the colour scheme of water, sky and sunset red gives Offshore the feel of elegance and style, yet comfort, perfect for the whole family! More pictures to come so watch this space… OR why not pop down and see it for yourself? Previous Post: 5 reasons to get app ‘appy! Next Post: Banner-tastic Bridport Arts! Very nice CuCo Creative. You’ve definitely hit the New England feel with the logo design, it reminds me of US hand painted sign writing. Can’t wait to see more photography!